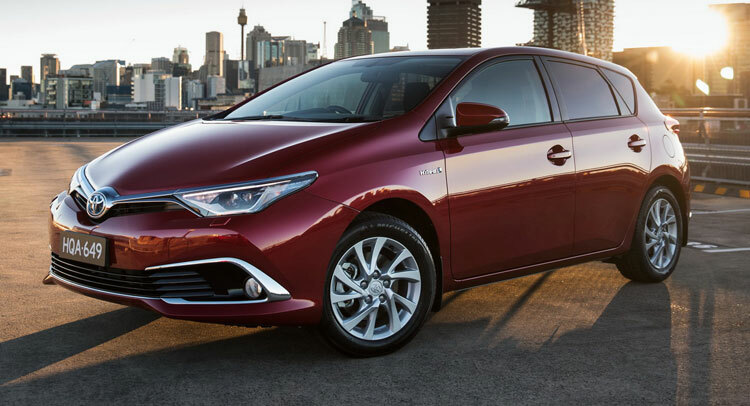 The corolla is one of Australia’s best-selling models and Toyota has made it even better by adding a hybrid variant to the Corolla Range. Car Advice managed to get their hands on one and they’ve reviewed it for those of you living in Australia. Priced at a MSRP of $26,990, it sits just under the Corolla ZR by $2000 and even though it costs less, the standard model comes with a bevy of features including some that it borrowed from the ZR like the dual-zone climate control, auto-levelling bi-LED headlights, LED daytime running lights, and keyless entry/ignition. The hybrid also comes equipped with a few tech features like satellite navigation with SUNA live traffic updates and the Toyota Link connectivity, both accessed through a 4.2-inch multi-information display. To differentiate the hybrid from the ZR, Toyota made a few changes. The hybrid is getting a set of 16 inch alloys instead of the 17 inch rims found on the ZR. You also won’t be seeing leather seat trim, heated front seats or an auto-dimming rear-view mirror. They had to do something to justify the $2000 difference. Under the hood sits a 1.8-litre petrol engine with an electric motor and the battery pack is located under the passenger seats so the cargo space won’t be compromised. With the aid of a battery, the hybrid Corolla’s total tank range is claimed to be 1100km even though the tank itself is just 45 litres. Overall, the 2016 Toyota Corolla Hybrid scored a rating of 8 out of 10. Last edited by Scion iM News; 06-28-2016 at 04:29 PM. Interesting combo, but pretty pricey for a Corolla. I'm wondering how the appearance will change when the switch is made to the 2017 Corolla Hatch in the US. Is it truly going to be just a rebadge? It sure is a nice looking car! I know I like the lower grill a lot more than the iM version. I saw one at my local dealer (just down the road from me and the same dealer I bought my petrol model from). This hybrid model takes in my opinion the nicest styling cues from the Corolla hatch available here from late 2012 up until early 2015 (mine) and the one that came after (currently still being sold and visually identical to the Scion iM). So it looks like a conservative update of the 2013 - 2014 model as opposed to the arguably more flamboyant and aggressive looking petrol Corolla hatch. In my personal opinion this Hybrid model is the best looking Corolla hatch ever (and I've owned Corollas since the very first Corolla hatch - the AE80 model I bought brand new in 1986). I think the reason it is a bit more conservative looking is that Toyota Australia are pitching this more at mature buyers such as myself than younger ones. Probably the same market that they aim the Corolla sedan at. As for differences with the petrol model, perhaps one of the most significant is that the Hybrid has independent rear suspension as opposed to the torsion beam all Corolla hatches have had here since the ZRE152 model right through to the one currently being sold. Oddly enough, Toyota Australia did not opt for the independent rear suspension on the Hybrid because it was better. They used it because it was the only way to fit the hybrid drivetrain on the car! As far as Australian prices are concerned it is actually a pretty good deal considering it is a Hybrid. At the recommended retail of $27K AUD it would not be too hard to get one on the road for the low to mid $28K range with a bit of haggling or waiting for a sale to come up. And it is priced at only $1,500 more than the petrol version of the SX hatch with CVT transmission - that model being the closet one we have here in specification and appointments to the Scion iM. When you take into account exchange rates and the cost of cars here in Australia compared to other countries that go through much higher sale volumes, I think you guys will be surprised at how cheap it will be in the US. Would not surprise me if it is priced extremely aggressively given the pollution issues facing the States and the desire to get as fuel and pollution efficient cars on the road as possible. I find it interesting (and disappointing) that the power output of this Hybrid is a tiny bit less than the petrol (100 kw versus 103 kw). I say that because the next car up in the Toyota range (our Camry) comes in both petrol and Hybrid versions and the Hybrid version has about 15 kw more than the petrol version. This helps to mitigate the significant weight increase over the petrol model. So it is a bit disappointing that they did not take full advantage of the technology and have it putting out something like 115 kw (easily possible), especially since just like the Camry, it is a significantly heavier car in Hybrid trim. Silly me, I was reading it as US Prices. I agree, it is really nice looking. I think it looks okay but I'll give my vote to the iM version. Just my personal preference.